We love the lights at Temple Square and headed over the last night Brian was in town. 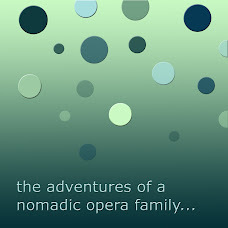 He is currently in Boston rehearsing for three Messiah concerts this weekend. Jane and I are joining him later in the week and Colin is going to have a fun weekend with Nana. Brian was inchrage of the night photography as he is quite clever with the night photos. It was also a chance to play with our new camera. Colin had to play with Lightning McQueen for a while. I put Colin in a hat I bought in Peru 10 years ago for myself. He looked very cute. Sometimes you have to touch the lights. Thankfully as far as we know there have not been any more terror threats on the Temple. We pray for peace and tolerance of every one's beliefs. Jane was over-bundled. It was quite a mild night. Nana came with us, as did Elizabeth and her roommate Kim. We met up with Zendina and family. The kids had a great time running around. My old college roommate Alisa was in town for Thanksgiving and let us meet her two children. Very cute little guy and gal. When I was pregnant with Colin I was very happily invited to take their wedding photos on their beautiful day. Thanks for the visit! Some friends we met in Israel were in town and they came over for some photos. As Colin loves being in front of the camera, he kind of cannot help himself but get in photos. 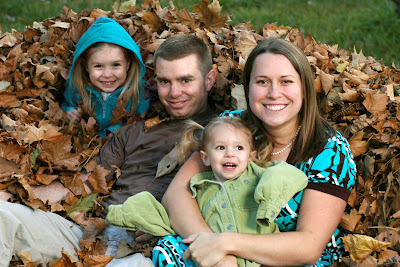 Very cute family. We were so happy to find them when we were in Tel Aviv, and are lucky to have seen them a couple times since. 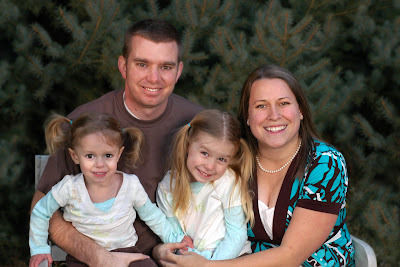 They are expecting a new little girl next year and will head to Japan after Israel. We got to meet our cute nephew this week and took some photos. He's a very sweet little guy. The baby kept sliding down the pillow we had with the backdrop so his dad decided to hold Will on his lap and hide. Brian helped by holding up the backdrop with both hands and one foot. It was a crazy Thanksgiving. Above is one of Brian's garden pumpkins that he had been saving to make extra special pie (below). It was very special, especially considering he has been working to make this pie for months. The pie formed a star for the upcoming Christmas season. Brian and Colin dug up more carrots from the garden Thanksgiving morning and Colin took the biggest one for his own. He really ate quite a bit of that carrot. Brian's pecan pie, made with his secret weapon of Golden Syrup. The turkey fed us well. Things got too crazy with everyone eating to take any photos of our actual Thanksgiving, but here is the table a few minutes before dinner. Colin had a major meltdown right before dinner but happily bounced back. Colin helped me test the light for Mallory's photos. He had a play-doh truck in his hand that Brian made. It was a fun night, thanks to lots of work from Brian and my Mom. My mom makes these great, HUGE Christmas stockings for everyone. (When she made one for Brian and I was commenting about how hard it will be to fill such a huge stocking my mom's response was "that's your problem not mine.") Since I did photos of Mallory in her's last year, my brother wanted some of her in the stocking this year too. Colin can't help but jump in too. She is a very sweet little girl. After 6 days away and accidently spending last night at JFK, Brian is home and we could not be happier. Since she has not had her photo taken in a few weeks, we made sure to get Jane today. I am feeling like a very negligent parent because Jane has not been photographed in about 3 weeks (the above photo is a month old). And with my good camera gone, I feel bad because she is doing so many cute things. She is a dear little baby, very happy and good natured although she is giving me some sleep problems. She went for a well-child check this last week and we found out she is an entire 18 pounds and 27 inches! She is nearly off the charts after being slow to gain weight as a newborn. Colin was exactly the same way when he was a baby and is now off the charts for his height and weight. He is 40 inches and 40 pounds which is quite a feat for someone not even 3 years old. He is wearing the clothes of a 4 and 5 year old and as we have mentioned, goes on all the rides at Disneyland that many older children are afraid of. My kids seem to have inherited my overactive growth hormone. I was always in a hurry to grow up. My siblings used to tell me to act my size because asking me to act my age would have been regressive. 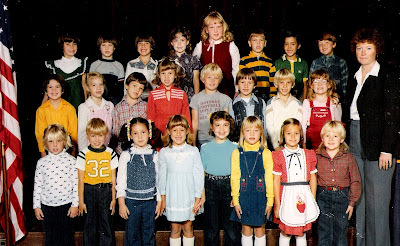 Can you find me in my first grade photo below? Grade school photographers must think it is hilarious to put the tallest child in the middle of the back row. We have had this trend verified by other tall friends. Hilarious! 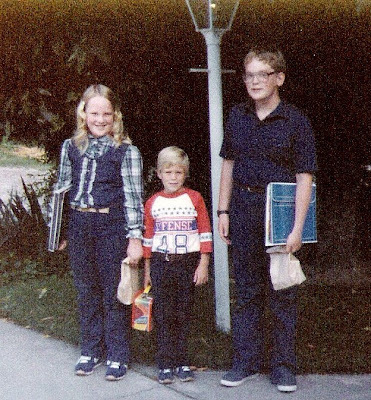 It did not scan very well, but here I am with my brother and cousin on the first day of second grade. My cousin who I am standing next two is 9 months younger than I am, and my brother is almost 5 years older and also tall for his age. I was very excited about my ruffle shirt, new trapper keeper, and my awesome blue and white Nike shoes, which were a women's size 7 (at 7 years old). When I started the 3rd grade we had moved to Chicago. I was 5'3 and taller than my male teacher that year. My friends at school later told me that on the first day they thought I was the student teacher and not their fellow student. 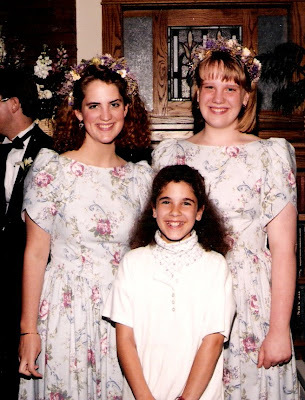 This is my sister and I at my other sister's wedding when I was 12. I had reached my adult height (5'10) by age 11. Also in the photo is my best friend Lara from 5th grade (a normal sized child). I was not bothered by my height and being several heads taller than most of my friends. I have always wanted 2 more inches but don't think I am getting them. Best of luck to my children who are likely always going to be tall for their age.